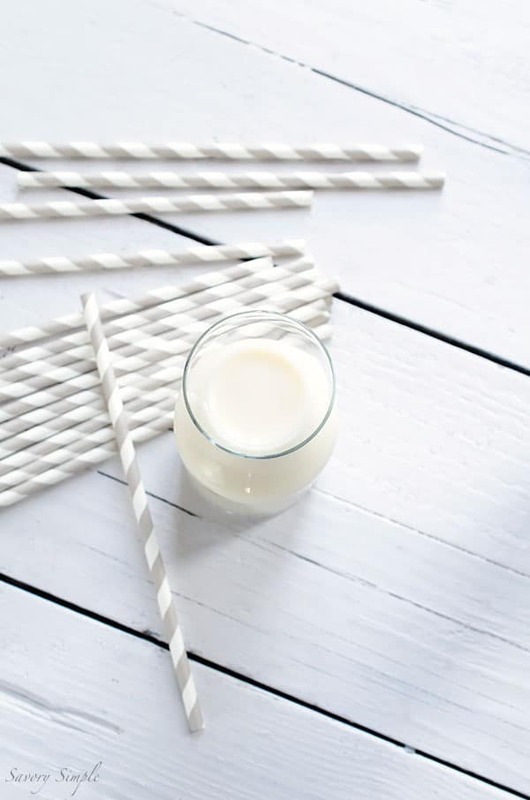 It’s very easy to make homemade soy milk! The final product has a smoother taste than the store bought versions (and no weird filler or thickening ingredients like carrageenan). This is pure soy milk. I made soy milk! Last week I also tackled homemade tofu. I love a good iced soy latte when it’s hot outside, but these days I try not to order them at cafes, because many store bought versions contain carrageenan, which I’ve realized is a migraine trigger. I enjoy making things from scratch every now and then to understand the science behind certain food products. Since I had an open bag of dried soy beans after preparing the tofu, I decided to also make homemade soy milk. If you read my tofu post, you know that I do not recommend making homemade tofu. It’s not work the hassle, in my opinion. There’s too much effort involved considering that the final results (at least MY final results) taste exactly like inexpensive store-bought tofu. Why bother? However, I do think homemade soy milk is a much more worthy venture. 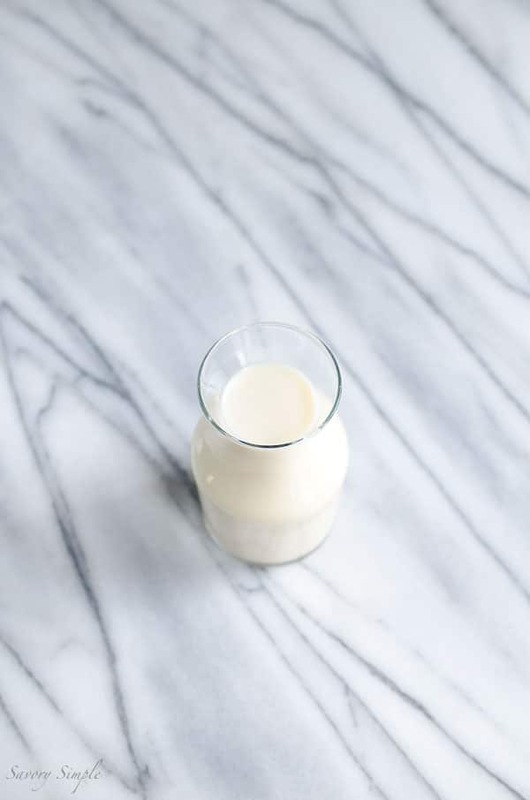 If you’re a fan of soy milk, this homemade version is easy to prepare and it has smoother flavor than pre-packaged soy milk. I liked it. And there are no weird ingredients, unless you consider soy beans weird (and we won’t get into that here). Will I be making this regularly? Nope, I don’t even make almond milk from scratch very often and that’s super easy. In general, I like modern conveniences. But now I know how to make it. And you do as well! 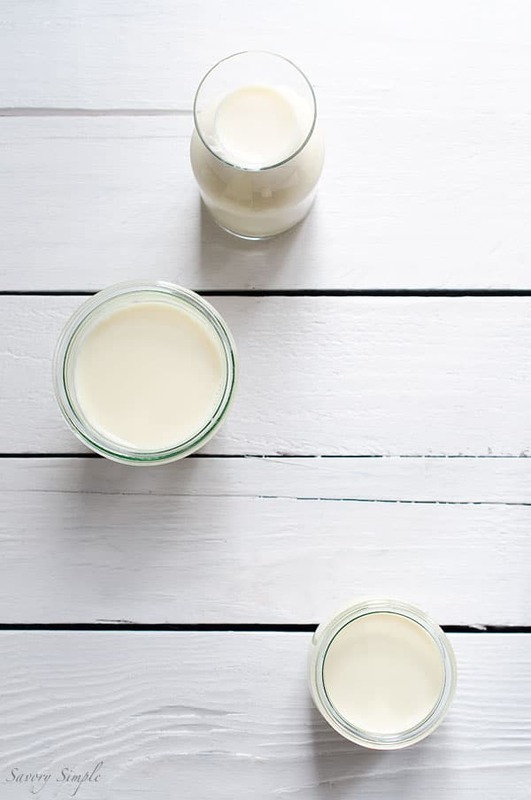 It's very easy to make soy milk from scratch! The final product has a smoother taste than the store bought stuff (and no weird ingredients). 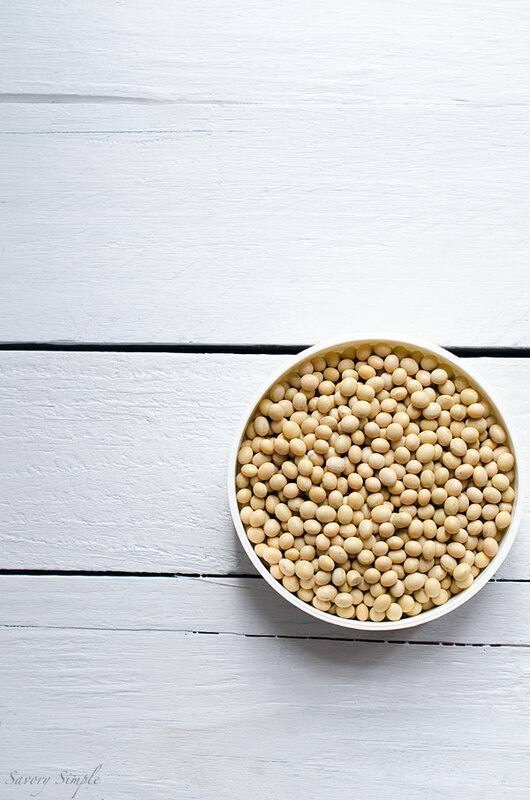 Rinse off the soybeans and place in a large bowl. Add enough filtered water that the beans are covered by several inches. Allow the beans to soak for 12-18 hours, or until the skins pop off easily when squeezed. Drain the beans and place in a blender along with 6 cups water. Puree until very smooth, 2-3 minutes. Strain the liquid into a large bowl through a butter muslin, triple layer cheesecloth or nut milk bag. Make sure to squeeze out as much liquid as possible. Discard the solids (or look up other ways to use them in cooking). Place the liquid in a large dutch oven and bring to a simmer, stirring with a rubber spatula to avoid scorching. Continue to simmer on medium-low heat for 20 minutes, stirring frequently. 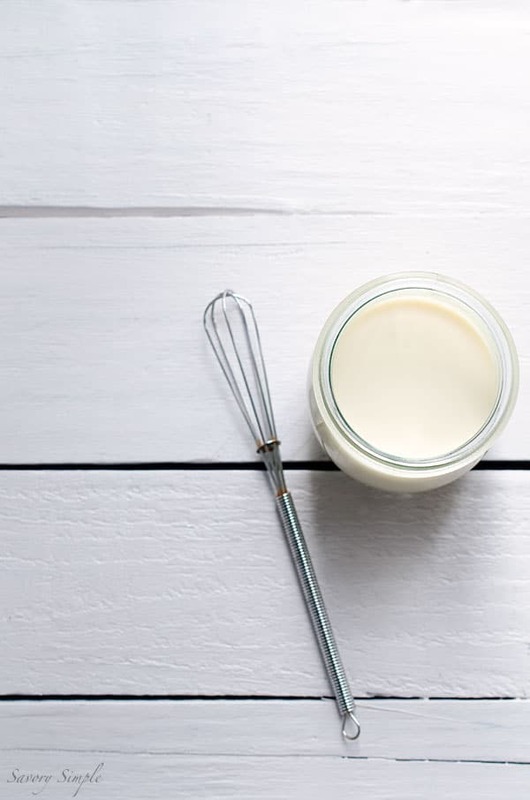 Allow the soy milk to cool and then store in the refrigerator. Use within 3-4 days for best flavor. I like to let the soy milk reduce for a thicker final product. For thinner soy milk and a greater yield, simmer over low heat. I drink a lot of almond and soy milk, but have never taken the initiative to make either at home. This does look simpler than the tofu, though you styled both beautifully! I prefer almond milk as well, but we keep soymilk sometimes because my husband likes it. I agree that it’s fun to try to tackle these kinds of projects at home, even if it’s just once! 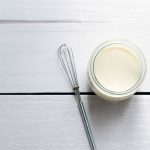 I love how there is just two ingredients in this soy milk recipe! Thanks for sharing! Pinning! There are so many wonderful alternatives to cow’s milk, it’s a revolution! I have a bag of soybeans in the cupboard that I was saving to make soyburgers, but I might have to make this instead. Pinned! I feel the same way about soy products, weirdly. It’s hard as a vegetarian to stay away from soy, but I do try. I’ve just heard so many bad things about it relating to bone health and hormonal health… I dunno! I’m glad you shared even though you won’t be doing it regularly :) I have had “real” fresh soy milk from Chinese grocery stores (ingredients being just water, soybeans, and sugar) and I always preferred it. You crack me up! I made homemade tofu, and am right there with you, so not worth it! But I have not made this, I will need to try it. As I like to try all things homemade like a mad crazy woman! I’ve never seen soy milk look so beautiful! And I never would have thought to make it from scratch. Almond milk or coconut milk? Sure. But for some reason, homemade soy milk had never crossed my mind. I get so grossed out when I read the labels on non-dairy milk at the grocery store… they all have carrageenan and other gums / thickeners / preservatives in them. I bet homemade tastes a million times better, too! I know! I’ve found a few brands of almond milk without carrageenan but the texture always reminds me of cornstarch slurry. Blech. I’m still too lazy to make it every week so I deal with it in lattes and cereal. WHAT? I so have to make this. Beautiful pics gurl! LOVE.